To get started with your Chromation Spec Dev Kit you will need to install the USB driver and interface software for Windows. Download and install the USB driver. It is available directly from FTDI here. Download the application software available here. Download the directory by right-clicking on the "Download button" on the upper right corner of the window and select "Direct download". Unzip the directory in the desired installation location and run "setup.exe" to install the software. Connect the evaluation module to your PC prior to running the interface program. Run "Basic Interface with Wavelengths.exe". Click START to begin data acquisition. Counts are the raw 10-bit ADC conversions of the 128-pixel line scan sensor output. This data is not dark-corrected or averaged. 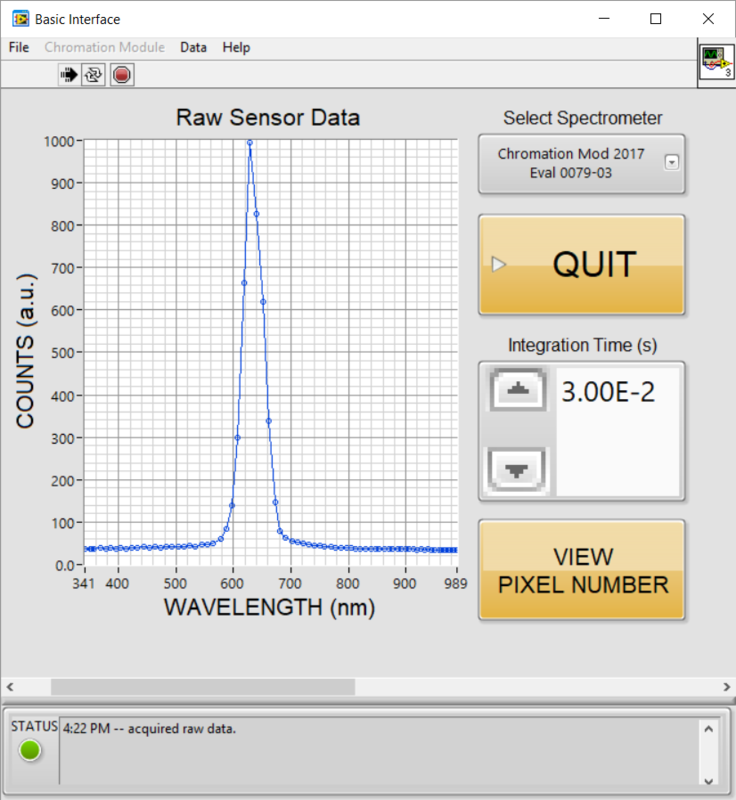 Click VIEW WAVELENGTH to switch from pixel number to wavelength. To save data press Ctrl+S. The data will be saved in an ASCII text file. Header lines begin with the "#" character. Data is two-columns, tab-separated. The first column is the pixel number (x-axis), the second column is the ADC counts (y-axis). To stop data acquisition hit QUIT or press Ctrl+Q. Note this will not close the window but it will stop the program, to restart the program either click the white LabVIEW arrow near the menu bar or close the window and reopen the program.